Using data to determine the best (and worst) champion synergies in League. Hello and welcome to the Duo Awards, where we look at the data from every single possible champ combination to figure out which champs have the best (and worst) synergy in League of Legends! But, before we get to the nominations, let’s talk a little bit about the scores. When we set out to find the best champion duos, we started by looking at the winrates for each pair of champs when they were played together. We found that whoever was super strong at the time was basically the “best” duo for everybody (in this case, Volibear was the win-machine). While this is accurate—champs that are strong overall are gonna be strong duo partners—it wasn’t really what we were trying to measure. We wanted to know what champs play well together overall, not which champs were the flavor of the month. So we created a new formula that accounts for individual champion winrates and got a clearer idea of how one champ’s presence in a game impacted the odds of winning for every other potential teammate. Using this formula, we calculated every duo’s synergy score. We put this score on a scale from 0-10, where 10 is Wombo Combo City and 0 is Sorry I Bard Ulted Over Your MF Ult Again. Aside from the prestigious Duo Awards, we can use these synergy scores to help measure the impact of team compositions. It can be a hard balance to find: Team comps and champ synergies should matter and be interesting, but shouldn’t be such a big deal that games feel unwinnable by the end of champ select. Knowing these numbers can help us try to find that balance. We’re looking at global data from Riot regions, across all MMRs, in ranked solo games, for patch 8.5 only. That might seem like a ton of games to pull from, but the numbers can be off for some of the less popular champions. In order to be eligible for the Duo Awards, the pair had to play at least 2,000 games together. Ideally we’d like a bunch more games (like 40,000), but this should be pretty accurate. We totally disregarded champions in roles that showed up in less than 10% of that champion’s total games. Sorry to all you Soraka top players. When individual winrates get super high or super low, the calculation for synergy starts to fall apart. Kai’sa had just been released, and everybody was still figuring out her kit and trying her in every role. She wasn’t doing super well but was very popular, so her winrates and synergies are kinda funky here. OK! WAKE UP! CAVEATS OVER! Ahem—Without further ado, the moment you’ve all been waiting for! Let’s begin the Inaugural Champion Duo Awards Ceremony!!! OH WOW!!! League’s leading lovebirds take the first place prize! Congrats, Team Firespider! There could be a ton of factors that cause this combustible arachnid duo to fizzle out, but our best guess is that it has more to do with the damage mix than anything else. In fact, A LOT of the lowest synergy combos are double AD or double AP, especially on mid/jungle pairs. It’s probably the same problem with Team Undying Orange over there. 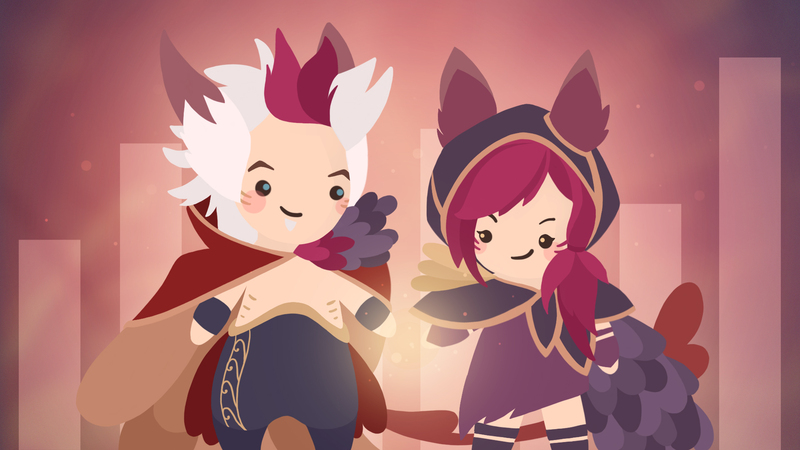 Rakan is a bit of a different story; the flipside of his great synergy with Xayah is that he doesn’t have the same chemistry with other lanemates. And so begins the bonus categories: BEST SKINERGY COMBOS! Yee haw! For this one, we just went down the synergy chart and tried to remember what skins everybody has. It wasn’t as scientific as everything else so we might have missed some. Let us know if you find a pair that dethrones the Wild Western Scarecrow-Swordsman combo we all know and love. Next up: the AMUMU’S FRIENDS FOREVER AWARD! For best synergies with the saddest little mummy. Aside from Jayce, it looks like Amumu’s best chances for friendship are with some of the edgier champs. Runners up go to Zed, Karthus, and Talon. We think it’s even weirder that more wombo combo-ey champs like Miss Fortune or Galio aren’t up here. Next up: the THE BANDLE CITY BEATDOWN AWARD! For the best Yordle-only synergies. Honorable mention goes to Fizz and Poppy, who would actually be third here, but we’re not sure if Fizz counts. Poppy also deserves extra recognition for being such a generally-great duo for other yordles, even across two different roles. And for our last award of the night, we have THE ENEMY OF MY ENEMY IS MY FRIEND! For the Runeterran rivals who have the most synergy on the Rift. …actually, most of the champs who are feuding in Runeterra also bring each other down on the Rift. Kudos to the winners for being able to put aside their differences and focus on the ultimate goal: Taking down the enemy Nexus. And that’ll do it for our inaugural Champ Duo awards! To show our appreciation for your attendance, we’d like to present the tool we used to determine our winners. Go crazy and let us know what you find, or just look up your main and find your favorite teammates. Enjoy! Bilby enjoys writing words and building Nashor’s Tooth on Bard. I'm Riot TKDJoe, I work as an analyst on the publishing strategy team. I'm a second degree black belt in TaeKwonDo, and main support (Rakan and Tahm Kench). I'm Benobo, an Analyst on Core Gameplay. I only have one degree and it's in Math, and my Rakan is better than Joey's. Nancymon works with Insights to make colorful data visualizations and annoyingly cute doodles. Outside of work, she is a sloth enthusiast stuck in the body of a cat lady.